Mung, rice, and veggies. In 20 minutes! Dietary changes can be a shock to your digestive system and it can be daunting trying to cook something if you’re used to grabbing a meal on the go. Trust me, I get it! As I was preparing today’s lunch, I watched the clock and noticed that it took me a mere 20 minutes. So in the spirit of making healthy meals quickly, I’ll be doing a set of blog posts called 20 Minute Recipes where I lay out Ayurvedically sensible, seasonally sound recipes that are easy to prepare (and often ones you can just throw in a pot and set a timer). 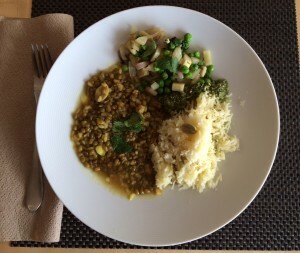 Today’s recipe includes basmati rice, green mung dal, sautéed fennel and spring peas with a bonus addition of some chutney if you have a couple of extra minutes. This should yield enough for 2-3 people for one meal or a full day’s worth of food for one. Make this in the morning and pack it up in an insulated lunch box and you’ve got food for the day. Heat 1 tsp. ghee in a small pot, add in saffron and cardamom, let the spices heat up for a minute, then add rice. Add in 1 3/4 cups of water and put the lid on with a bit of room to vent. Cook rice for 12-13 minutes (or until water is soaked in and rice is fluffy). Remove from heat and cover for 5 mins. Add 1 tbsp ghee, and then add garlic, and turmeric. Heat for 30 seconds, then add the mung beans. Let those sauté for a minute. Then add 4 cups of water. Once the water comes to a boil, put the lid on the pressure cooker and cook for 17 minutes on medium heat. While mung and rice are cooking, dice shallots and fennel. Shell the peas, too. Heat up 1 tsp ghee and add shallots. Cook for a few minutes until soft. Add fennel and a splash of white wine if using. Saute for a few more minutes until fennel is soft. Then add peas. Sautee for another minute. Then cover and let steam for a few minutes while you check on rice. That whole process should take about 15 minutes, depending on how quickly you can dice and prep. If you have time to make this, it’s a yummy bonus addition. While fresh is always best, sometimes I’ll make a big batch at the beginning of the week and add to dishes. I vary it based on season and my digestion, but this is a good for late winter with the added cashews. Put cilantro, fresh ginger, lemon or lime juice, 1/8 cup water, and cashews into a small mixer and blend. Melt ghee and cumin seeds in a small pan. Add the sliced garlic clove to the ghee and cumin seeds. Saute for 1 minute. Add to the blender and blend once more. The chutney should be thick and not too runny, but add more water to get the consistency you want. Enjoy! Please post questions if you have them. This entry was posted in Recipes by Alex Krasne. Bookmark the permalink. Yum! I will try this– everything sounds delicious. Awesome, Lisa. Let me know how it comes out!